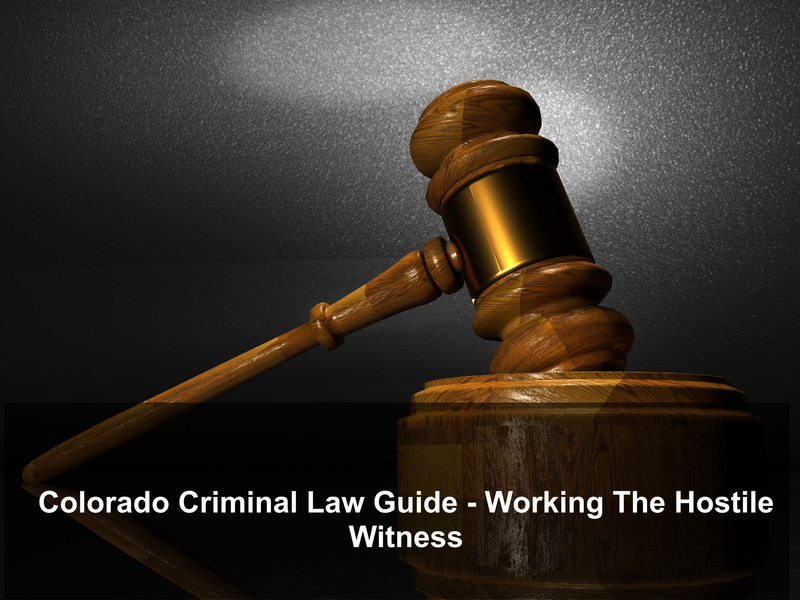 Colorado Criminal Law Guide – Working The Hostile Witness – One of the most difficult challenges for a Colorado criminal defense lawyer is locating and interviewing key adversarial witnesses also known as hostile witnesses. These witnesses must be identified and a clear path to “strategic neutralization” of their testimony must be taken for an effective defense plan to be executed in any criminal case. Interviewing all of the primary potential defense witnesses prior to trial is important – but interviewing potential prosecution witnesses is critical. Somehow getting these witnesses “on the record” through a recorded, a written, or through their acknowledgment that your notes of their testimony are true by initialing those notes – is paramount to a successful defense at trial. Taking statements from pro-defense witnesses is easy and sometimes, even unnecessary – but potential pro-prosecution witnesses are almost never comfortable writing our or signing a prepared statement. Even police witnesses or co-defendant’s will balk at cooperation with a criminal defense lawyer’s request for an interview and to take their statement. In the Colorado criminal justice system, there is generally no right to “take a deposition” as compared to a Colorado civil case. While that might come as a surprise to most – it is the law in many states. While there are many reasons for taking statements from potential witnesses – when interviewing the State’s witnesses, there are two central goals. Central Goa1 1: The interview should focus on learning facts about the State’s case to develop not only the weaknesses in the defense case in chief but to and develop “rebuttal evidence” to challenge and if not successfully attack that evidence – at least neutralize it. Central Goal 2: The interview, if timed properly, will prevent the State from “coaching” the witness before trial. If the witness has already been coached – the goal then would be to develop the nature and extent of that coaching and to use that information to “impeach” the witness at trial. While Colorado is a one witness consent state for recording other persons in a conversation – (Colorado is a “one party” consent state – you need not obtain a person’s consent if you are recording them as long as you are a party to the conversation, there are certain ethical rules that may prevent Colorado civil attorneys from recording a witnesses’ statement without their express consent, this rule does not apply to criminal defense lawyers and their investigators. For the Colorado lawyer ethical rules on this subject – please follow this link. Colorado rules of discovery do not require pretrial disclosure (discovery) of statements taken from potential witnesses by the defense of those witnesses who may or may not testify at trial. 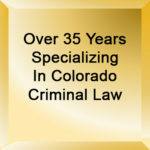 Therefore, the most strategically advantageous tactic for a Colorado criminal defense lawyer is to try to record, (with the witnesses consent), or somehow reduce to writing all the most significant State’s witnesses – which statements can later be used to cross examine – impeach and otherwise damage the credibility of those witnesses at trial. A quick note – lawyers cannot testify at trials. If a defense lawyer has the opportunity to interview an adverse or hostile witness, that lawyer should bring a seasoned investigator to the interview. Witness “coaching” is a serious and ongoing problem in the Colorado criminal justice system. Overcoming a so called “Prosecution witnesses’ “ refusal to talk to the defense side of a case is difficult to say the least but when the witness has been advised not to talk with the defense – if that can be proven – there are steps that should be taken by Defense counsel to try to compel an interview or to have that witnesses’ testimony suppressed before trial or, at a minimum, “punish” the State for acts that are unethical. While we are nation of “teams” – “us and them” – the analogy should not apply to the courtroom where lives are at stake. Witnesses to not “belong” to either side of a criminal case and hostile or adverse witnesses have a moral duty to talk to both the Prosecutor and the Defendant’s lawyer to insure a fair trial. Clearly some State witnesses will have a natural inclination not to want to talk to opposing counsel. These witnesses have the right to refuse to engage in an interview. 1. When a key prosecution witness refuses to speak to the defense – the question should be posed as to whether the prosecutor, a member of the prosecutor’s officer, law enforcement or a member to la enforcement (such as a victim advocate) has instructed the witness not to talk to the defense attorney. 2. If a Defense lawyer learns that instructions have been given to any witness not to talk to the defense, either directly, or implied, the courts repeatedly held that this kind of urging to remain silent is a violation of the Defendant’s right to due process of law – which includes a right to investigate a case thoroughly. Prosecutors are in a unique position to consciously or unconsciously, strengthen their case in chief in the very manner the prosecutor asks questions, cause a witness to “fill gaps” in their memory, “clarify” and eliminate what are essentially the absence of factual clarity by the artificial removal of ambiguities, inconsistencies or contradictions in the witnesses’ testimony – all resulting in distortions of the fact finding purpose of trials. 3. Should it be discovered that the State has taken steps to prevent the fair interview of so called State’s witnesses, the criminal defense lawyer should file a Show Cause Motion To Hold The Prosecution In Contempt Of Court. Dismissal – dismissal on the grounds that the State’s misconduct has so impacted the defense case that there is no way to know how much harm has been done or a way to correct for the damage already done. Court Ordered Deposition – so that the interview can take place to determine the level of damage that has resulted from the actions of the State and to obtain the information sought by the defense in the first instance. A Cease and Desist Order – To Stop the practice of coaching witnesses not to cooperate. The prosecutor should not discourage or obstruct communication between witnesses and the defense counsel, other than the government’s employees or agents if consistent with applicable ethical rules. to provide defense counsel with information which such person has a right to give. The Steinberg Colorado Criminal Defense Law Firm – Dedicated To One Client At A Time. If you or someone you know has been has been arrested or charged with a crime in the Denver Metro area, please call H. Michael Steinberg. H. Michael is one of the most experienced criminal defense lawyers in Colorado and he will aggressively seek the best possible result in your Colorado criminal case. The Steinberg Colorado Criminal Defense Law Firm invites you to contact us immediately. To reach us now – and obtain a free phone consultation, please feel free to complete and submit the form on this page (it goes directly to H. Michael’s cell phone) or call him at his Denver Tech Center home office at 303.627.7777. Under urgent circumstances, please call his cell phone directly at 720.220.2277. One of the most difficult challenges for a Colorado criminal defense lawyer is locating and interviewing key adversarial witnesses also known as hostile witnesses. These witnesses must be identified and a clear path to "strategic neutralization" of their testimony must be taken for an effective defense plan to be executed in any criminal case.